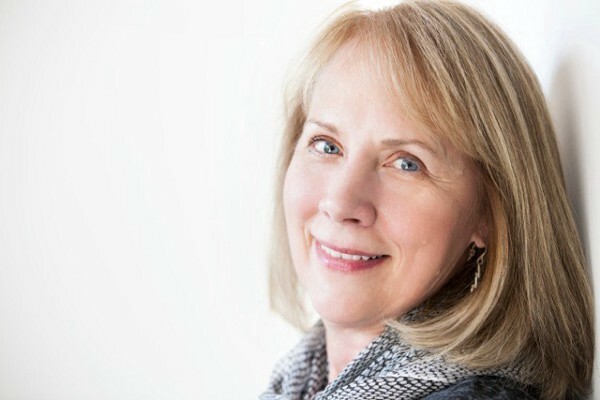 In the sixth installment of this series exploring family history and its conversion into a faithful narrative, Luanne Castle reconstructs the life of a distant relation on her grandmother’s side, a woman whose resilience in the face of disaster sparked the writer’s imagination. The inspiration and factual foundation for the creatively nonfictional account of Louise’s life and death can be found in detail — with photographs of records and the personae involved — after the piece. This installment notes especially the use of census reports in tracing obscure relatives. To read and print this piece as a broadside, drag it to your desktop. All the ways of self-pity were open to her. too tired to stand. She avoided their eyes. were a cow hobbled for the sake of her calf. her grandson, who still wore white dresses and ringlets. and no reason to think there wouldn’t be more. The husband’s wagon is hit by a streetcar. as a live-in and sends her wages to her mother. late at night her correspondence course. Work study work study. She was no cow. 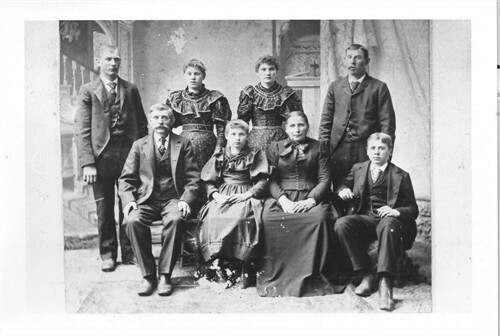 When my grandparents and I were going through a stack of old photos, my grandmother paused over a portrait of the Gottfried (Godfrey) and Alwine (Noffke) Waldeck families, in which my great-grandmother Clara is seated between her parents. Her brother Fred stands on our left, just behind their father. 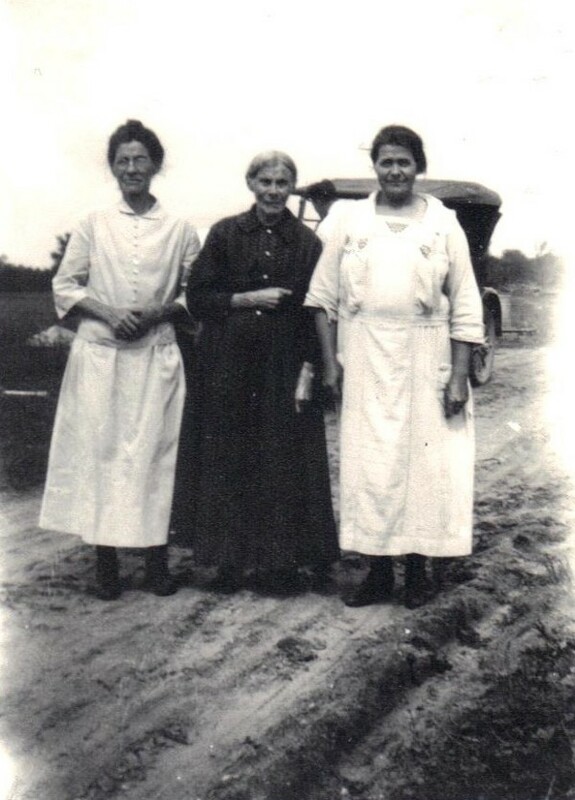 My grandmother told me that Fred was hit by a streetcar, suffered brain damage, and went to live in the Kalamazoo State Hospital, the institution for the mentally ill.
Caroline and her mother: Caroline is on the left, Wilhelmina in the middle, and another woman on the right. She tightened her lips after that. I didn’t know whether she didn’t know any more or wouldn’t say. For decades I wondered if Fred Waldeck had ever recovered and left the hospital. Even after I started researching in earnest, I couldn’t find out what happened to Fred; it seemed as if he had just disappeared. There was no death certificate, for instance. I did find an article about his fourteen-year-old son, Edward, being hit by a car while biking on 6 July 1912, but there was no mention of the boy’s parents. He lived with his grandmother. Ed must have recovered, because I discovered that he was the officiating pastor at the marriage of my mother’s aunt and uncle. Then, while searching the records of the state hospital, I accidentally found Fred’s death certificate. He was recorded as Fred Walback. He had lived at the facility for 53 years, 11 months, and 1 day. And they still couldn’t spell his surname correctly! On the record, his wife is listed as Caroline Myer, but Fred was a widower at the time he passed away on 22 January 1953. I felt so sad for him. So who was Caroline, and what was her life like? 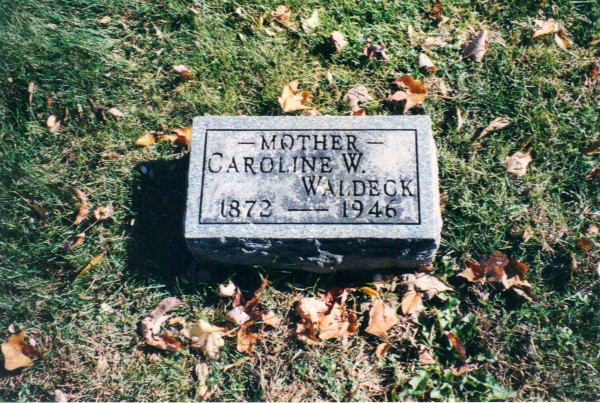 She was born Caroline Wilhelmine Meier on 29 January 1872 in Waterloo, Ontario, Canada. She passed away on 14 April 1946 in Caledonia Township, Kent County, Michigan, which is why Fred was already a widower at the time of his death. Registration of Caroline and Fred’s marriage, 1896. 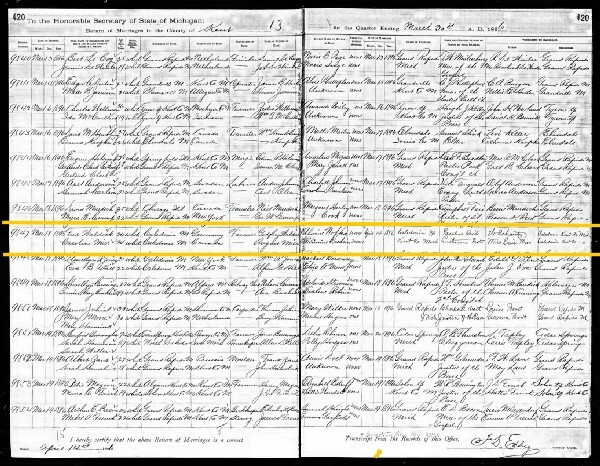 A dig through official records showed that on 14 April 1896, Fred and Caroline married at St. Paul’s Lutheran Church in Caledonia, Michigan. Their only child, Edward, was born 25 March 1897. Using the death certificate figure for the time that Fred lived at the state hospital, his accident probably occurred in 1899, when Ed was only two years old — and Fred and Caroline had only been married three years. Why then was Ed living with his grandmother in 1912? Where was Caroline? I turned to census reports for preliminary answers. These reports are available online and are hugely useful for tracing who lived where and when. 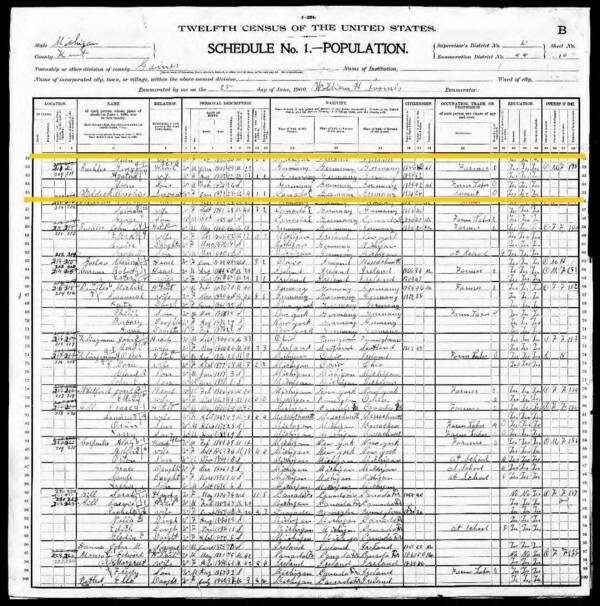 The 1900 census, showing Caroline working as a servant. I started with the 1900 census because that would have been recorded just after Fred’s accident. I found Caroline not with her son and mother, but living as a servant in the farmhouse of the Buehler family in Gaines Township, Kent County. This discovery stimulated my imagination about what life was like for Caroline, a young mother whose husband was involved in a catastrophic accident and had to be institutionalized. 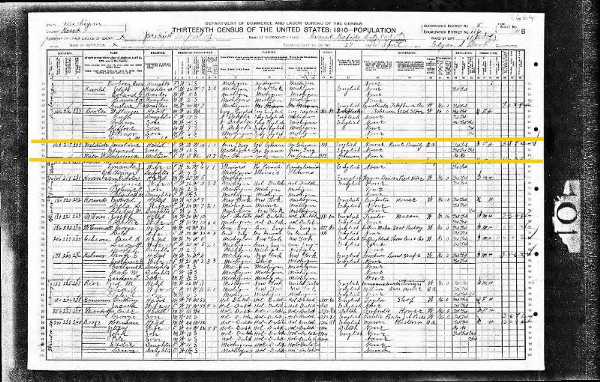 The 1910 census report lists Caroline at home in Grand Rapids with her son, Edward, and her mother, Wilhelmina Mier. So why was Ed not with his mother two years later? The 1910 census gives an important clue. Caroline’s occupation has now been “elevated” from servant to private duty nurse. It’s probable that her nursing job took her away from home when she took extended jobs in someone else’s home. It must have been helpful to have her mother there to help raise Ed. My admiration for Caroline grew when I realized that she must have educated herself to be a nurse all while earning enough money to support herself, her son, and possibly her mother. She began to take on a personality for me. My “reward” for this work was that I eventually made contact with a Meier relative who shared many photos of that branch of the family with me, including photographs of Caroline and her mother, such as the one above. I also know now that Ed married Cora Van Strien and passed away in 1971 in Los Angeles, but I do not know if they had any children. It is possible that Ed was the last Waldeck in that branch. 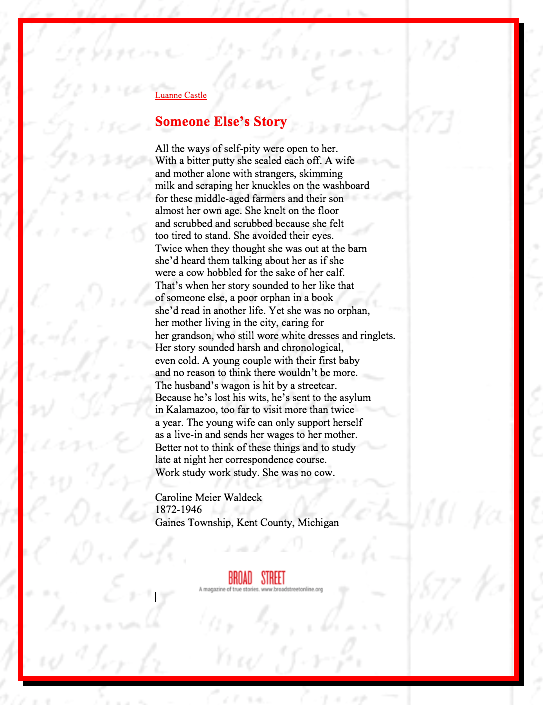 Previous postPresenting our 2018 Pushcart Prize nominees … Next post"Familial Bodies," on a brother's suicide and a father's scorn. Memoir by A. W. Barnes.